Having informally supported a range of cultural, arts and community initiatives in Batley (2009 - 2014) - including the launch of Batley Festival in 2012 and the successful £2 Million Arts Council England lottery funded Creative People and Places Programme bid for our area - we decided to establish BatleySmile CIC social enterprise in late 2014 to make our work sustainable. Looking for an inspirational collaborative organisation to help guide and inform us and share our experiences we joined the Locality network in April 2015. BatleySmile will develop a variety of community, arts and cultural initiatives supporting the wellbeing of local residents and organisations. To revive, sustain, develop and promote Batley’s historic town centre as a vibrant community hub for all Batley residents to enjoy. 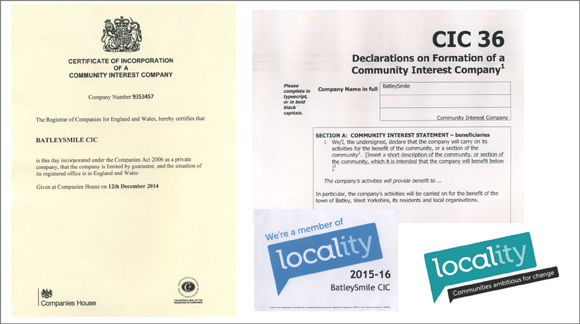 BatleySmile will provide advocacy for the development of a sustainable community theatre and arts venue in Batley. To assist in developing and implementing initiatives that support the marketing of the town of Batley locally, regionally and internationally.